Now here's a novel idea, giving soundtrack collectors the opportunity to hear segments of short movie scores they would probably have otherwise missed. Thankfully this isn't some quickly thrown together collection. The selection process involved the curation of dozens of entries and showcases new work by composers ranging from industry veterans like Angelo Badalamenti (Twin Peaks) and Nicholas Pike (Sleepwalkers), via current names such as Joe Kraemer (Mission Impossible: Rogue Nation) and Cyrille Aufort (A Royal Affair) and new, fresh talent like Anne-Kathrin Dern (The Jade Pendant) and Patrick Neil Doyle (the son of composer Patrick Doyle). 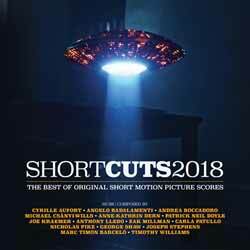 For this volume, the represented genres on Short Cuts include fantasy, drama, horror, sci-fi, comedy and documentary. Of the 15 tracks (1 hr, 17 sec, 48 sec), without a doubt, 'Hathor' composed by Marc Timón, is the one stand out piece. It has so much passion and several beautiful twists in its themes, that it's hard to ignore. Also of note is the opening music from 'Invaders', by Anthony Lledo, who channels the spirit of Danny Elfman's Edward Scissorhands and the late James Horner's Casper. Other highlights include Zak Millman's engaging and thematically rich 'Sylphvania Grove'; Patrick Neil Doyle's subtle 'Angels of Our Past'; 'Modern Magician' by Tim Williams is a beautifully sweet inclusion, but painfully short; and 'The 716th' by George Shaw, which gives a nod and a wink, in one segment, to Kramer's work on Mission Impossible: Rogue Nation as well as John Williams's score for Return of the Jedi. Andrea Boccadoro's 'Unburied', beautifully pays homage to Beethoven's 'Moonlight Sonata', as elements of that famous piece are intertwined with another, original, theme - the two playing off each other beautifully. The album even includes an original song, 'Lotta That Silhouette Girl' by Carla Patullo. Not necessarily a highlight, but worth mentioning as it helps to add a little variety. Overall this is an incredible collection that's well worth getting hold of.